•	The model is available in three different capacities. 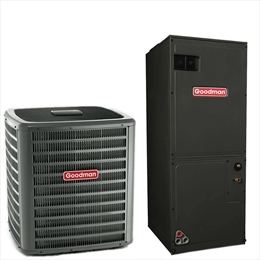 The Goodman DSXC18 central air conditioner is available in three different capacities. You can select from capacities ranging between 34,000 and 56,000 BTU/H. All models of this central air conditioner have two-stage operation and are AHRI certified. The air conditioner has a lifetime warranty. It is very durable and offer whisper-quiet operation. A flip side of this series is that It is not as energy-efficient as it competitors. However, if you are replacing an old model for it, you will see a good cut down in energy consumption. •	It is always recommended to buy cooling unit that abides by Energy Star guidelines, established by the Environmental Protection Agency. This is to conserve energy. DSXC18 abides by these regulations. 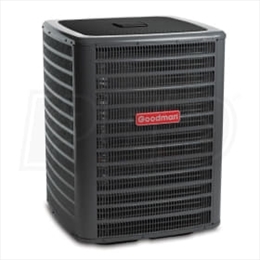 •	The USP of this air conditioner is that it runs on environmentally friendly R-410A refrigerant. This refrigerant is chlorine-free and is formulated to protect the ozone layer. The R-22 refrigerant that was used by A/cs erstwhile was harmful for the biosphere. •	This unit is equipped with a two-stage scroll compressor. A scroll compressor has less moving parts, which means energy consumption. •	If you want whisper-quiet operation, you can buy a high-density foam blanket for your compressor. The unit is basically a quiet unit that does not give out sound more than 71 decibels. So you will be comfortable without a blanket as well. •	Thu unit also offers an excellent feature of upkeep. It features an on board diagnostics that can store six fault codes. You will know whenever a snag is surfacing. You will also have multiple access points that will make repairs and annual upkeep easier. •	The warranty of this model is very attractive. You get a lifetime warranty. If you unit fails, you will receive a new unit. But you should be the original purchaser and you should be living in the same residence where it was installed. All parts on the device are covered by a 10-year parts warranty, which is also an excellent benefit.